Over the past decade, Slovenia has been funnelling the majority of its investments into its road network, particularly the motorways. Investments in railways have been neglected, which is why railways have not been able to compete with road transport. But this trend has been changing since 2011. Investments in rail transport have been increasing since 2014. The proportion of funds allocated to railways in 2014 amounted to 52%, which is above the EEA-33 average. The total volume of investments in 2014 represented 59% of investments in 2008. Due to the economic crisis, the funds for investments declined in the period 2008–2012, but since 2012, they have been steadily increasing. 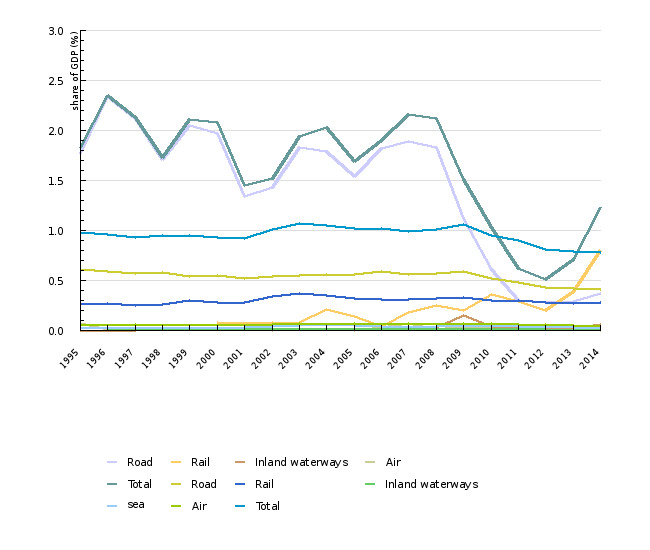 This indicator shows the volume of investments in infrastructure of road, rail, air and maritime transport in the Republic of Slovenia in the period 1992–2014; this includes all investments in infrastructure except regular maintenance costs. Infrastructure investments include expenses for new construction or the expansion of existing infrastructure, including restoration, modernisation and larger repair work. Infrastructure includes land, the construction of permanent transportation infrastructure, such as roads, railways, buildings, bridges and tunnels as well as fixed installations, equipment and installations in connection with them (signalisation, telecommunications, catenaries, power plants, etc.). Infrastructure maintenance costs are costs for the maintenance of infrastructure in such a condition that it may operate (SORS, 2004). Infrastructure of air and maritime transport also includes investments in equipment for traffic management and the provision of safety. The development of infrastructure is important, as it strengthens the integration of markets, improves trade and fosters development and regional cohesion within Europe. Nevertheless, transport infrastructure negatively affects the environment in direct and indirect ways. The indirect effects of transport infrastructure relate to their impact on biodiversity and fragmentation of ecosystems, as well as to the impact of nearby infrastructure on protected areas of nature. In Europe, the greatest threat is represented by the impact of new infrastructure on ecosystem fragmentation. The direct effects of infrastructure relate to noise, energy consumption and emissions of greenhouse gases and other pollutants resulting from transport. Annual reports 2016, Motorway Company of the Republic of Slovenia (MCRS), Ministry of Finance 2016. EEA, Transport infrastructure investments (TERM 019), 2016. To develop balanced and equally burdened transport sub-systems. to develop expressways of the sea and promote short-distance maritime transport. a fully functional and EU-wide multimodal TEN-T ‘core network’ by 2030, with a high-quality and capacity network by 2050 and a corresponding set of information services. The indicator presenting investments in infrastructure of individual transport sub-systems usually indicates real transport policy of countries, regions or towns; namely, investments in road infrastructure continue to prevail at the operational level despite the declaratory support of sustainable transport modes in strategic documents. In recent years, though, this has begun to change; since 2011, the state has been committing most funds to the development of a rail network. The indicator shows that for almost two decades, the Republic of Slovenia has been directing the majority of its extensive infrastructure investments into the construction of the motorway network and, to a minor extent, into other state roads. Railways, which have a much higher sustainability potential, are lagging behind in development due to insufficient investment. Existing railway tracks, built primarily in the 19th century, do not fit modern transport needs with regard to their parameters and capacities, and are completely uncompetitive compared to the modern road network of Slovenia and modernised railways in most EU countries. Fortunately, this trend has been reversing since 2007 and, in 2011, the majority of investment funds was allocated to railways for the first time. The investments further increased in the period 2013–2015 as Slovenia wanted to disburse the allocated cohesion funds. However, investments in road infrastructure in Slovenia came almost to a halt due to investments in rail infrastructure. As a consequence, the condition of roads has been deteriorating and is now critical in some areas. Air and maritime transport do not play an important role in the composition of infrastructure investments of the state. In addition to the national budget, the most important financial resources for the construction of motorways were loans and long-term infrastructural bonds. After the completion of the motorway network, financing of construction will not terminate – according to the National Motorway Construction Programme, the motorway programme (more than EUR 10 billion in total) will continue to be financed until 2033. At the same time, the costs of management and maintenance of the motorway network will increase rapidly. Future investments in railway infrastructure are structured in much less detail. Nevertheless, projects of modernisation of the 5th trans-European corridor, which has been placed among the top EU priorities, are being carried out with EU support. In recent years, changes in the structure of state funds invested in particular sub-systems have been observed. In 2000, the resources for the motorway network amounted to 80%, while 13% was intended for state roads and only 5% for the railway network. With the completion of the motorway network, the investments have slowly begun to move primarily to the construction and modernisation of the railway network. The share of investments in the motorway network has been decreasing since 2005: from 87% in 2005 it dropped to 24% in 2014. In the same period, the share of investments in railway infrastructure increased to 52% (with a notable increase since 2007). In recent years, the share of investments in state roads has remained more or less stable: 22% in 2011, 21% in 2012, 31% in 2013 and 23% in 2014. Investments in road infrastructure were strongly affected by the economic crisis. They have been decreasing since 2008, when they were at their highest in the last 20 years. 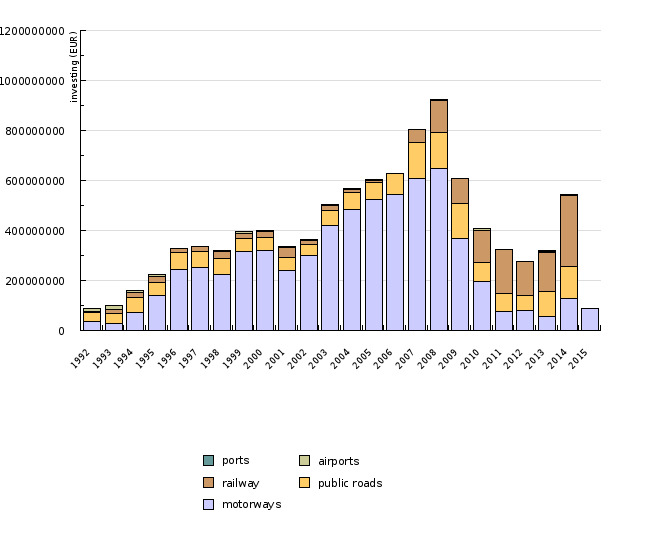 In 2012, the total amount of investments in transport sub-systems reached only 30% of investments in 2008. Since 2013, investments have been increasing again: in 2014, they almost doubled compared to 2012, reaching 59% of the amount from 2008. Many EU Member States have also been dealing with investments in infrastructure of non-motorised transport modes (walking, cycling) by constructing state cycling networks and walking paths as well as encouraging sustainable transport modes (by co-financing the local infrastructure of these transport modes). Recently, the state and the local communities in the Republic of Slovenia have also devoted more attention to the cycling infrastructure. A strategy for the establishment of a state cycling network has been prepared, while the investments have frequently been complemented by initiatives at regional and local levels in the form of common investments in cycling connections, which primarily have tourist and recreational importance. Increased investment in cycling infrastructure has also taken place in larger towns. In EU countries, most transport investments are intended for the improvement of road infrastructure. Over the last decade, investments for other transport modes (rail, maritime and air) have finally started to increase alongside those in road infrastructure. 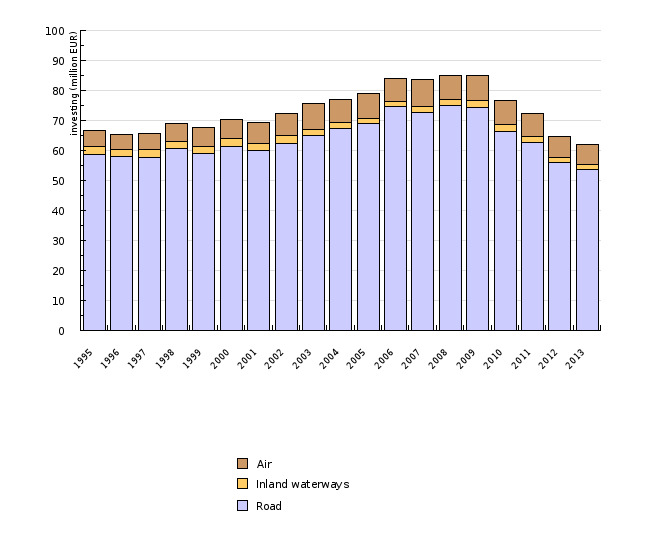 In 2010, investments in infrastructure in the EEA-33 countries started to decline. Thus, as a result of the economic crisis, investments in infrastructure in 2013 were 23% lower than in 2009.